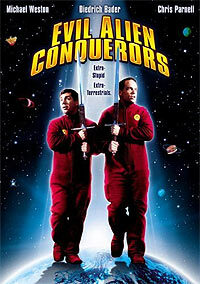 Evil Alien Conquerors (2003) - Sci-fi-central.com.  USA  2003  89m   Directed by: Chris Matheson.  Starring: Michael Weston, Diedrich Bader, Chris Parnell, Tyler Labine, Elden Henson, Beth Grant, Missy Yager, Phil LaMarr, Joel McCrary, Michael McShane, Martin Spanjers, Jacob Franchek, NiCole Robinson.  Music by: David E. Russo. My-ik and Du-ug are evil alien conquerors from the planet Kabijj. They have exactly 822,000 tilkrons (2 and half days) to behead all of mankind. Otherwise they will feel the wrath of a 100 foot giant, named Croker. Armed with only their swords, these inept evil aliens find Earth harder to conquer than planned. Will alcohol, fast food, mad cows, and women stand in their way? Or is the Earth doomed? Recap: My-ik and Du-ug is sent to Earth to conquer and kill all mankind. To complete their task they have two and a half day, then a 100-feet tall giant human-eating monster will be sent after them. Unfortunately for our two evil conquerors, their swords came through the transport extremely small. Now the aliens have to trust their abilities, skill and superiority to finish their task. Unfortunately, they have none. And discovering such treasures as Smirnoff Ice, and two lovely ladies, they start to doubt their mission. Comments: Now, there are good movies, and there are bad movies. In the bad category there are just plain bad movies, and there are so bad movies that they're funny. This movie creates a completely new category. This movie is so extremely awfully bad, that it is not even remotely funny. What was supposed to be jokes, was just plain stupid. What was supposed to be a story was a bad edited, poorly explained, predictable mess. What is supposed to be the great ending, is just a coverall dressed man, stumbling about screaming. And that is supposed to be the best in the entire movie? Now, I understood that this was low budget, but please, I've seen far better movies with far less budget. Written by Matheson, also the author behind Bill & Ted, I can't imagine what he has done to loose all talent the past decade. Where Bill and Ted is a masterpiece (in comparison anyway) in fun simplicity and a success on all levels, Evil Alien Conquerors fails in every aspect. Acting performance is as bad as other aspects of the movie, and i can't imagine how actors like Diedrich Bader and Tori Spelling ended up in this mess, it wasn't for the money obviously. The best part of the entire production is the title 'Evil Alien Conquerors' that actually made me smile, and fooled me into waste 86 minutes of my life. Review by Enchorde from the Internet Movie Database.